It is a really nice place in a spectacular location on the Potomac River just north of George Washington's Mount Vernon. In fact, George Washington used to own Collingwood. I installed the last company of painted marching figures I have on hand. This makes 41 ranks of 4 men for a total of 164 men plus one mounted officer. About 110 of these figures were painted by a professional figure painter. The rest I did. There is room for another 10 ranks. Adding more soldiers won't embellish the scene very much as additional figures will be partially obscured by the sunken road and worm fence in the background. I also want to leave some "breathing space" between the soldiers and the backdrop. Finally, I plan to add a wagon with the unit's baggage so I need to leave room for that. A wagon with 6 mule team takes up a good amount of space. This unit is part of the 7thNY Steuben Volunteers, a regiment that was composed of 2 and 3 year men. The two-year men mustered in for two years service on April 23, 1861 in New York City with Company I from Brooklyn. In the two years the unit lost 102 men from wounds and 47 from other causes. It took nearly 50 percent casualties at the battle of Fredericksburg (243 killed or wounded out of 488 engaged). The two year men mustered out on April 25, 1863 in New York City, while the remainder of the regiment combined with the 52nd New York. This regiment is notable for two things, one it was mostly composed of German immigrants many with European combat experience, and secondly that part of it was involved in a friendly fire incident at the battle of Big Bethel at the start of the Peninsula Campaign. Why haven't the men policed up that scrap lumber for firewood? This view shows a mock-up of the next structure planned for the scene. Two companies installed. One more to go for the 2 year regiment heading home. "The column was compact, and the glittering muskets looked like a solid mass of steel, moving with the regularity of a pendulum." W.T. Sherman, "Memoirs of General Sherman"
It might not be as spectacular as the Grand Review of the Army of the Potomac that Sherman was describing in the quote above, but this scene does look cool. I have installed about two thirds of the planned number of marching soldiers for this regiment. The final total will be 175 men, well under strength for a full regiment, but not unheard of for a regiment after several bloody battles and two years of service The figures along the route are watching the parade and perhaps vicariously sharing in the soon-to-be-mustered-out-soldiers' joy. I also started to install the trees along the far wall. Before going final on the trees I painted some distant camps and extended the background trees the backdrop. ﻿ I made some new trees by taking using the tops of my wife's miniature crepe myrtles. I was careful selecting the ones to use, as some just don't have the right limb structure. But others look very good placed against the backdrop with more detailed trees in the foreground. Nothing says "civil war" quite like a worm fence. I thought long and hard about adding one, as chances are the fence would have been confiscated for firewood by scrounging soldiers. But I did find several prototype photos showing fences that survived near some camps, so I decided to add one to this scene. I cut a bunch of twigs to 3 inches long and then split them with my knife. In about 15 minutes I had enough rails to make this fence. The trees in the background look good from this low, distant angle. This small shed was based on the prototype photo. Work continues on detailing Potomac Creek. 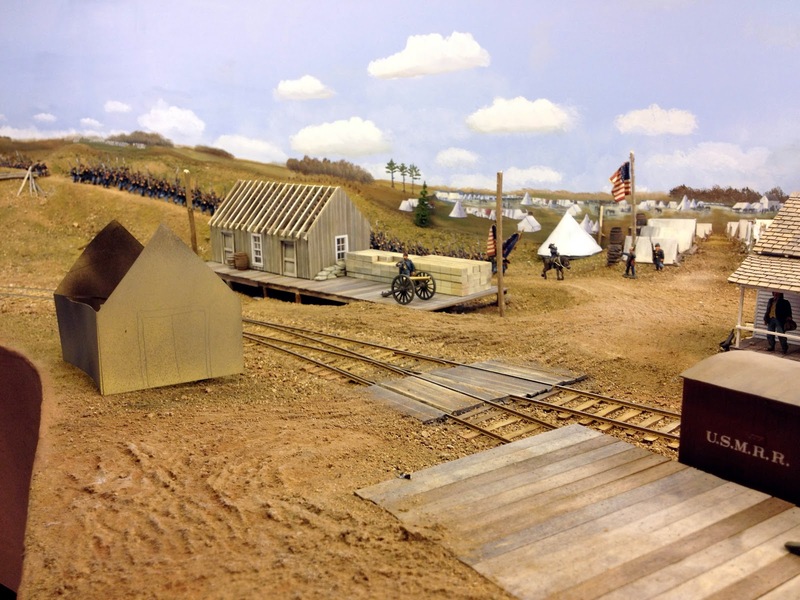 I added two more sheds - one on a new platform, extended the track side platform, added a fence along the ridge crest, made three trees, and started installing the marching column of two-year men. A fairly productive weekend. I am thinking about adding a third shed to the scene since the prototype photo shows a cluster of at least 4 sheds and houses at the north end of the bridge. I used my laser to scribe board and batten siding with uneven spacing and irregular battens.. The structures sit on post an beam foundations. Here I use my try square to lay out the posts. The shed sitting on its platform. The line of boxes in the back and front inside the building create a snug fitting frame to hold the structure. The simple post fence was based on a photo. The tree in the back is sagebrush with Supertree sprigs added using hot glue. The two new trees are sagebrush tops attached to carved balsa trunks. I reworked the loading platform based on John Drye's suggestion. It is much more believable now. The wagon ruts leading to it work to unify the various scenic elements. I added a loading platform and a road crossing to the Potomac Creek Station scene. The road crossing consists of individual planks at a slight angle to the tracks. I filled in the approaches with dirt. Once the scenic material was wetted and glued, I added wagon wheel ruts. I like how the wood crossing helps tie the scene together by extending the road across the tracks and through the scene. After looking at it for a while I decided that having the stockade walls extend straight off the fascia looked odd. So I modified the ends of the stockade walls so that they now make right angles before they end at the fascia. The small hut between the tracks is a stand-in. I need to build a different, slightly bigger structure for that location. Switching action at Potomac Creek. It's tough to switch this location with a southbound train. I finished painting the backdrops for Potomac Creek Station. My intention for this area is to show a fairly extensive Army camp. There is also a road leading into the backdrop that will feature a long line of soldiers coming to the station. I first had to touch up the base sky color because plaster and paint splattered it during scenery construction. Then I added a distant low line of white haze and clouds. Next came the terrain. I prefer to paint the terrain on the backdrop when the base scenery has been installed. That allows me to match the colors better. I paid particular attention to the perspective. I avoided placing any large objects on the coved (curved) part of the backdrop. That helps avoid distortion when one views the backdrop from an oblique angle. It also makes the corner terrain look more distant. To depict the forest on the backdrop, I used some of my model trees as a guide. That way the trees on the backdrop will look like the 3D modeled trees. I continued the road on the backdrop being careful to match the colors and get the perspective right. Adding a corner where the road hits the backdrop helps manage the perspective. I was very happy with the way the road turned out. The transition is quite effective. Here is the scene with some of the unpainted trees back in place. Overview of the scene in progress. Platforms, supplies, tents, log cabins - much more detail still to be added. For the scene behind the encampments I used some prints from Brain Kammerer's artwork. Because there was a swale in the terrain I need to leave extra paper under the printed art to avoid an unsightly and hard to disguise line. This way the paper extends below the point where the model terrain hits the wall. Then I used my paints to blend the print with the foreground scenery. I can't say enough how useful Brian's artwork has been. Thanks again to Brian. To create the illusion of a bigger camp. I used a scaled down photo of my model huts on the backdrop. I built just 7 model huts. I laid them out in a company street. Then I took a picture of the huts looking down the street. I printed the photo, cut it out and put it on the backdrop on top of Brian's artwork. Voila - 7 huts just became 14. I printed Brian's background scene at a smaller scale making it look further back. John Crabtree stopped by to visit the layout last week. He is a Army Major teaching a course on strategic logistics planning at the Defense Logistics Agency. We had an interesting discussion focusing on logistics in the civil war. Using one of my box cars and the army bread boxes I made, we concluded that a box car would "cube out"before the weight of the army bread boxes would exceed the 10 ton capacity of the car. We estimated that the car could hold about 4.5 tons when loaded with army bread. John got to see some of the hooches I was building for Potomac Creek scene. Later in the week I built a 4x8 officer's wall tent with a fly. I used bond paper for the main tent and cooking parchment for the fly. The tent took about 4 hours to make, but hopefully subsequent ones will be faster. An interior view of the blockhouse. I only have the one distant shot showing the blockhouse, so I had to do some "imagineering" on how it was built. I consulted my Eric Sloane books and the HABS/HAER for examples of log cabin construction. I added extra rafters, as this building would be built sturdy in case it took fire. Here in the reverse view of the installed blockhouse. I installed the blockhouse on the hill top behind the bridge. 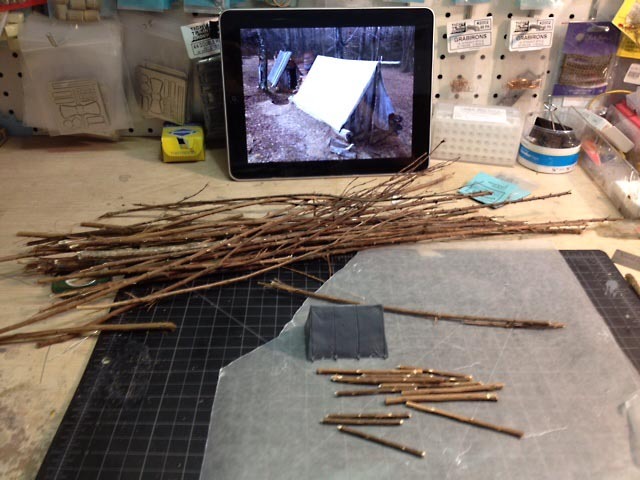 I made stockade fences using twigs I collected from a field near my house. The infantry squad inside are 28mm scale figures, but measure more like 36mm high, nearly O scale. I am not sure who made them. The soldiers are practicing their musket drill while inside the blockhouse. The low ceiling could interfere with the ramrods during loading, so the men are practicing to familiarize themselves with defending the bunker. Since the interior is visible, I will detail it. I will probably add a plank floor to the inside of the blockhouse as well as some other details. Using photos of the hooches from the White Oak Civil War Museum, I built some winter quarters. I used straight sections of twigs I collected in a field near my house for simulate the logs. I found it easier to cut a sub-structure out of cardboard to use in building up the log sides. I used CAA to secure the logs. For the mud chinking between the logs I used Elmers wood putty tinted with Spice Brown acrylic paint. Though I pre-painted the logs, I found I had to repaint everything once the chinking dried. I tried bond paper, tissue and cooking parchment for the tent fabric. I think the cooking parchment worked the best. For those that don't know, "hooch" is the Vietnam era slang for a field expedient shelter built by U.S. Army soldiers. Ipad showing prototype photo for reference. The twigs are prepared for construction. Lincoln Logs were some of my favorite toys as a child. Building these hooches reminded of them. would cross the tracks. I'll probably make some kind of corduroy road or planks. Even with wet ballast, it is starting to look good. Next up is to paint the backdrop in this area. No, this is not a commentary on McDonald's meat simulant. It means I have covered the last pink section of terrain in the main layout room. I still have a bit of pink left at Aquia Landing, but it is all gone in the main room. I painted the section behind Potomac Creek siding and added the base coat of scenery. While the scenery base layer dried, I took a set of cannon wheels and made ruts in the road as it approached the siding. They look good while they are wet. We'll see how they look when they are dry. While the scenery was drying, I put some of the scenery items temporarily in place to see how it will look. So far so good. It will be a lot of fun to detail this scene. Some scenic elements in place - looks good. More trees coming. It is almost time to install the marching regiment. The figures will come off their bases and be glued in place four abreast. These are 28mm scale wagons. The left is by Old Glory, while the right one is by Perry. There will be an encampment behind the station with as many winter cabins as I can fit. Like Day 1, Day 2 dawned bright and clear. I went for a morning run through Colonial Williamsburg. I forget how wonderful that place is. I didn't see too much directly applicable to my ACW project, though I did get a nice photo of a worm fence. When I arrived at the Mariners' Museum I was reminded that this was the 150th Anniversary of the Battle of Hampton Roads. When I picked the date for this trip, I knew this was happening, but I forgot. So I was pleasantly surprised when I arrived. The parking lot was nearly full as the museum had scheduled all kinds of extra activities, especially with reeanctors. There was also a conference going on for naval historians. There was so much going on that I am sure I missed a great deal. The museum had expanded quite a bit since my last visit about 12 years ago. The focus of the expansion is on the recovered USS Monitor turret, engine and other artifacts. It is great that they are doing this important work, but I got the impression that the Naval Museum of the Civil War in Columbus, GA has more information and better dioramas about civil war naval subjects. The Mariner's Museum also covers other subjects too, such as the ships of the Chesapeake, general maritime history from antiquity to current and a large display of small craft that I skipped this time as there was so much else going on. The exquisite Crabtree model collection is still there for viewing. Numerous reenactors had set up camp around the museum. A detachment of the 99th New York Infantry was there representing soldiers from that unit that were on the USS Cumberland when she was engaged and sunk by the CSS Virginia. D Company of the 99th NYSV Infantry unit suffered 10 killed, 15 wounded and 7 missing in that battle on March 8-9, 1862. The Confederate infantry had set up quite a nice encampment with a company street, stables and a mess area. An African American woman demonstrated cooking techniques. A blacksmith and gunsmith also were conducting demonstrations. There were representatives from the US Colored Troops, Signal Corps, Naval Officers and seamen from both sides, and a Confederate artillery battery from Norfolk, which is still active as a U.S. National Guard unit. Inside there were several other special exhibits including a group trying to make a park or trail connecting the ACW entrenchments near Yorktown, women sewing period clothing, museum staff advertising their research capabilities, people hosting quizzes (I got 100 percent right), a couple authors signing books, representatives from NOAA displaying work to make the Monitor wreck site a Federal Preserve, a group dedicated to shipwrecks of the mid-Atlantic, reenactors of the ACW era Christian Commission, and a spy hunt for kids. I shot some video too and plan to post that later this week or next.